Someone reminded me today that it was Gurpurab (Guru Ramdas), so I was reminded of the shabad I have heard so many times, Dhan Dhan Ramdas Gur. I checked, like I do now for every shabad when I hear it, it was written by Guru Sahib in Raag Ramkali. I made a simple Ramkali composition and recorded it so I would not forget it. Then I looked for other Ramkali compositions for this shabad, and I could not find it on youtube. If you know of a Ramkali version, I would love to here it. Whoever composed this, I would say its a very fantastic attempt. To make it more beautiful, please sit with someone who has learned and perfected the Tabla for years in the traditional Indian way (Guru Shishya Parampara). And second I would take the major mode elements out (and there aren't many, but there are some striking ones, like the descending passage on 3:05 which includes A and E, which are present in the major mode, but have no place in Ramkali). Further, if I were to do this, since this is a love song, I would soften some of the charged elements in the rendition that make it rough and tough. In that respect, there is another rendition of the same piece on the web which sounds a lot soothing. 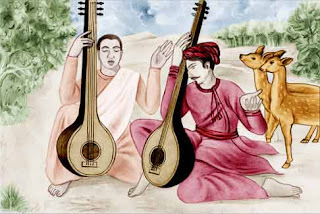 Rai Balvand, a rababi (rebeck player) in the time of Guru Arjan and co-composer with Satta, said to be his brother, of a Var included in the Guru Granth Sahib in the Ramkali musical measure. He was by birth a mirasi, Muslim minstrel and genealogist, and sang the sacred hymns to the accompaniment of a rebeck like Bhai Mardana played during the time of Guru Nanak. Not much authentic biographical information is available about him except that he and his brother, Bhai Satta, were contemporaries with Guru Arjan (1563 - 1606) for whom they recited sabdakirtan. According to another tradition, they started their career under Guru Angad sometime after he succeeded Guru Nanak on the latter's demise in 1539 and continued to serve the Gurus until the time of Guru Arjan. A story is recorded that Balwand had become so proud of his musical ability that he once refused Baba Buddha's request for the recital of a sabda. He was reprimanded by the Guru and was told that he (the Guru) was within every Sikh and refusing a Sikh to recite a hymn meant refusal to the Guru himself. On another occasion, Balvand is said to have requested Guru Arjan to let him and Satta have all the offerings of the Baisakhi day of that year so as to enable them to meet the expenses of a marriage in the family. The Guru agreed. But the offerings on that day fell far short of their expectations. They asked the Guru for more which he refused. Under the mistaken notion of their indispensability, both Satta and Balvand left the Guru, imagining that once they stopped reciting the hymns his following would dwindle. Guru Arjan sent for them, but they refused to return. When the Guru himself called on them, they spoke rudely of the House of Guru Nanak. Now discarded by the Guru, they found themselves alienated from the Sikhs. They suffered both mental anguish and fell sick with leprosy. A Sikh, named Laddha, petitioned the Guru on their behalf after rubbing his face with ashes (the Guru had threatened to have this done to anyone speaking on their behalf) and secured them forgiveness. Back in the presence of the Guru, they were cured of the disease. They then composed a Var, popularly known as Tikke di Var, in praise of the Gurus. They, perceived all the Gurus as sharing the same spirit, the same one light. Both Balwand & Satta, are said to have passed away at Lahore in the time of Guru Hargobind (1595-1644) and were buried on the bank of the River Ravi.